When readers visit your site, direct them to discussions by utilizing calls-to-action. Context is key when implementing effective CTAs. For example, someone who just arrived on your homepage will have different goals than someone who clicked a link to an article from Facebook. Depending on the following scenarios, different solutions will apply most effectively. Homepage: Discovery is your reader’s primary goal on your homepage. What are the latest stories? What should I read first? Start by adding comment counts to articles so readers know where discussions are happening. 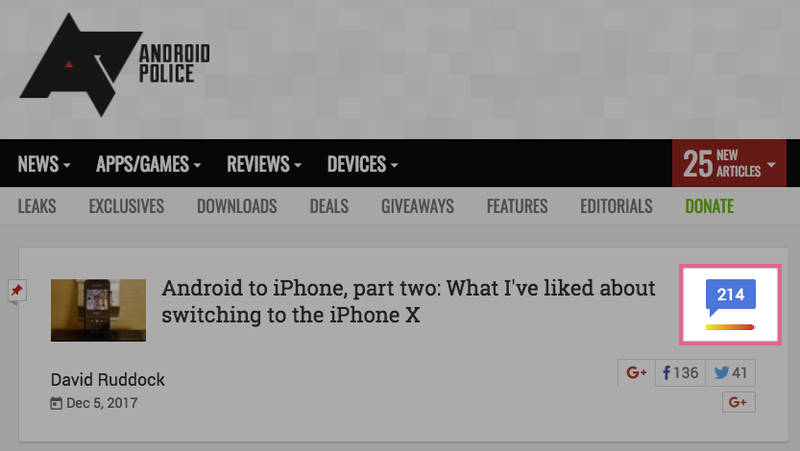 On Android Police, they display the comment count adjacent to every headline. This is accompanied by a dynamic “hotness” bar based on pageviews and social media activity so that readers can see at-a-glance which stories are trending. 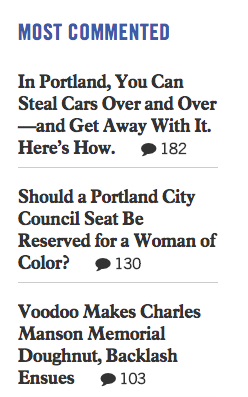 Another option is to add a leaderboard widget of top stories sorted by total comments. Show a list of recent comments to reward readers who comment and invite passive readers respond. You can implement either of these options using a variety of plugins if you’re on WordPress. For more control and configuration options, use the Disqus API to create custom widgets that match your site’s look-and-feel. Article page: Readers are spending the majority of their time on your site reading your content. After all, it’s the reason they follow and subscribe. If you want readers to comment though, it’s not enough to just invite them at the end of the story to “share your thoughts in the discussion.” Asking a direct question is a good start since it prompts readers to respond to a specific topic. But don’t just wait until the end to ask the question. Seed the discussion as early as possible by incorporating potential topics for discussion as a reader navigates the story. You’ll find that these early reminders set the stage for more thoughtful responses. Pro-tip: Link to the comments by appending #disqus_thread to the article’s URL. When readers click the link, it will jump directly to the comments section. Comments: After reading an article, readers have the opportunity to respond in the comments or see what others had to say. Start by posting a direct question as a Featured Comment. This provides a framework for readers to quickly jump in with something they can talk about. Next, turn on Discovery to display a list of recommended discussions happening elsewhere on your site so readers know where to head to next. Disqus makes commenting easy. Readers can comment across millions of sites using just a single profile, skipping the headache of creating new accounts for different sites. Using a real-time notifications system, they can also jump back into conversations to keep it going. Enable guest commenting: Provide the option for readers to comment without signing up for a Disqus account. This can be an effective solution for converting first-time visitors into engaged users. As these readers post more, they may decide to switch to a Disqus account to take advantage of the extra benefits. Add Trusted Users: If a user has a strong track record for posting high-quality comments, add them as a Trusted User. This allows them to post comments immediately without requiring moderation review and saves you further moderation time. Curate Restricted Words list: If it has been a while since you last reviewed your site’s Restricted Words list, here’s a good opportunity to update it. Remove any words that are poor signals for moderation action in your community. Filter comments flagged in your Mod Panel by Restricted Words to see example comments that were recently held for moderation review. Incorporate page navigation shortcuts: Make it easy to navigate a discussion on your site, especially if you publish a lot of longform content. Add a button for users to jump to the top of the page or directly to the comments in one-click. This is particularly important for mobile visitors where scrolling is a slower process. On Batman News, clicking the Batman icon on the top-right corner of the site brings you back to the top of the page when reading a story (Yes, it is exactly like using Batman’s grappling hook). When visiting one of the Wirecutter’s in-depth product guides on a mobile device, the topic sections are collapsed by default so you can easily jump to the topic you’re interested in reading first. This makes it easy for readers to join the discussion at the end of each guide with minimal scrolling. If you’re introducing commenting to your site for the first time, it’s a good opportunity to provide a short tutorial to help readers get started. Show them the steps to creating an account, the basics of posting comments, and a brief overview of your site’s Comment Policy. It’s new for everyone so encourage folks to get acclimated and learning together. When Buffalo Rising switched to Disqus, they announced the change in a new post. They instructed readers on how to sign up for an account and outlined the various benefits of participating. 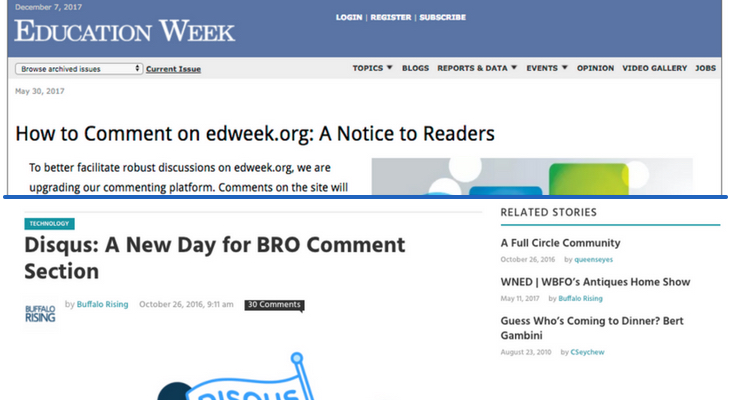 Similarly, when Education Week started using Disqus, they published an in-depth guide for commenting on the site, which they link to directly above the comments of every article. In it, they shared answers to frequently asked questions, information about the site’s community guidelines, and how to contact the site. Even if you’ve had comments on your site for some time, new readers may benefit from a quick primer that reinforces good habits for the future. Use opportunities like the release of new Disqus commenting features to start a conversation with readers about commenting. 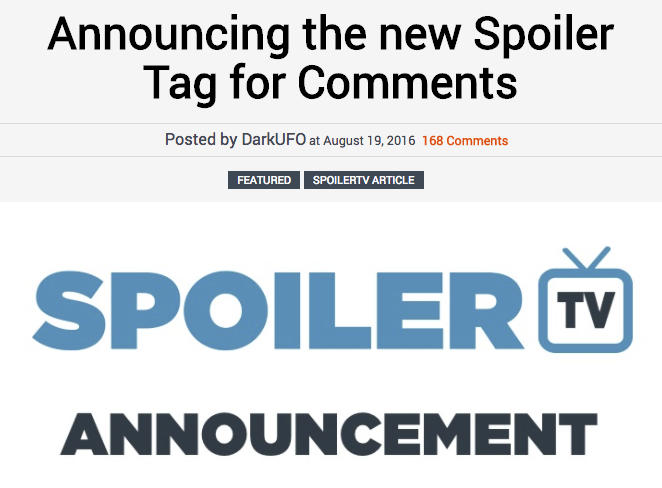 When we launched spoiler tags for example, SpoilerTV and Flickfilosopher shared the news with their readers and encouraged them to try out the new feature. Instead of spending time moderating off-topic comments, create a dedicated discussion thread for readers to talk about anything they like. This reduces your moderation time, keeps article discussions on topic, and provides a space for readers to interact with each other on your site instead of someplace else. 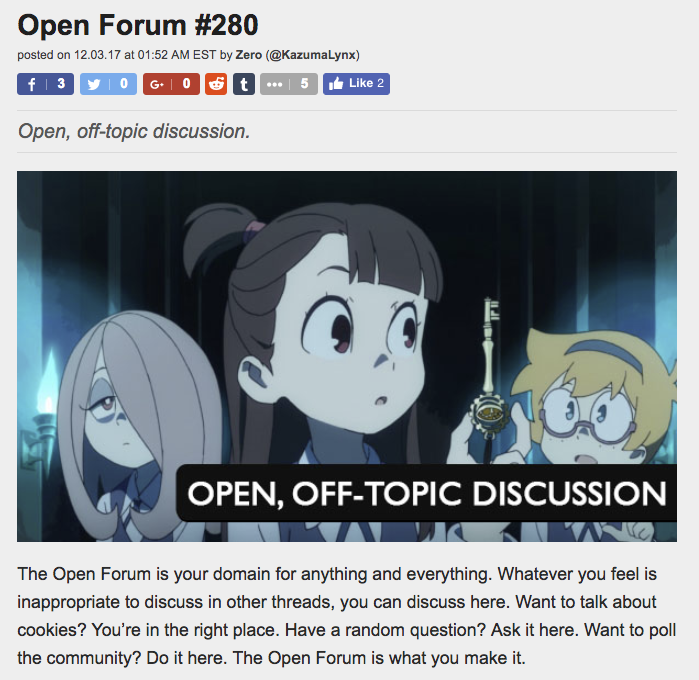 On Gematsu, a site for Japanese gaming news, they start new “Open Forum” threads every week and link to in the sidebar. These discussions routinely garner thousands of comments from readers who use the discussion to share and talk about their favorite games. For new readers, it can be intimidating to post their first comment. Think back to your first day at school or a new job when every face looked unfamiliar. The best way to make first-time commenters feel at home is to welcome them when they first comment on your site. Create a welcome thread that encourages new readers to introduce themselves to the community. This could either be a dedicated page on your site or a weekly series you publish to keep things fresh. When commenters create a new Disqus account, we send them a welcome email that links to a welcome discussion where they can introduce themselves to the community and how they discovered Disqus. Thank you for following along our guide to increasing reader engagement these last few weeks. We’ve come a long way since we first started talking about the importance of listening to your community. Those early conversations paved the way to leveraging comments to create more engaging content, opportunities to host events that fostered a shared sense of community, and equipped your most loyal readers to support the continued growth of your community. Wherever your journey takes you next, we hope that this guide has helped you discover important insights to be successful at growing an engaged audience. If you know someone who could benefit from this information, feel free to share this with them. Thanks for reading!